An Oasis® sunroom custom designed and installed by Surber’s Inc. is the perfect solution to adding enjoyable living space to your home. Surber’s Inc. sells and installs Oasis® Sunrooms. Vinyl sunrooms are our main seller as they provide many added benefits (go to Why Vinyl). The Oasis® series consists of two models 2600, and 3000. They range from seasonal to year round with many options. The choice and model would depend on your use, size, engineering conditions, and area you are located. All models are made of heavy duty extruded aluminum stiffeners completely encapsulated in solid virgin vinyl. All windows are fusion welded sash and mainframe. Both sashes operate and full screens are included. The design is complete with no visible screws for a finished look. For more information on any of our rooms, click the appropriate model above or below. for a finished look on the interior. Surber’s Sunrooms offer interior electical raceway. This means no exposed conduit for a much cleaner look. 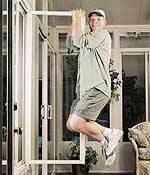 Oasis 3000 all vinyl sunroom offer the swing in to clean windows. 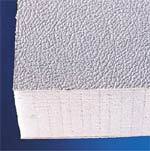 Oasis specially designed KORAD skin will not fade or dent like aluminum panels. Our engineered Insul-deck will provide warmth and intregrity for life. Sunrooms are also known as patio rooms, porch enclosures, patio enclosures, leisure rooms and glass rooms. Contact us today to get a free in-home estimate for a new sunroom – a place to relax, enjoy, create, play, or just enjoy the outdoors…indoors.